RPS-302 Controller With Remote Sensing Head - Deeter Electronics Ltd. RPS-302 Controller With Remote Sensing Head - Deeter Electronics Ltd. 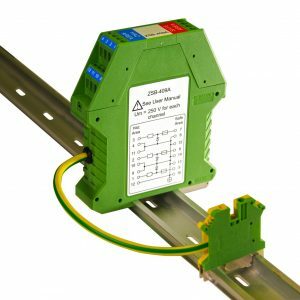 The RPS-302 has 2 sealed, multiplexed transducers with independent range control adjustments, LED indicators, and form C relay outputs. This sensor also has a unique master and slave feature which enables many of the same units to be used within close proximity of one another without cross-talk interference. For example, if three sensors are needed in a close area, one sensor would be left as a master and the other two would be slaves. This is done by means of the X IN, X OUT, and GND connection on the board. One sensor (master) would send a signal by means of the X OUT and GND terminals. These would be connected to the X IN and GND terminals of the other two sensors (slaves). With the sensors connected in this way, all units would be transmitting and receiving at the same time. This then would prevent cross-talk and enable all three sensors, or all six transducers, to be used at the same time in close proximity of one another. There are also separate turn ON and turn OFF DELAY potentiometers provided for each transducer. All four DELAY controls are located along side the black module inside the enclosure box. The remote transducers allow for mounting of the sensor heads in cramped spaces while the controller is out of the way. The (2) independent and isolated form C relays furnish N.O. and N.C. outputs. This sensor, operates at a frequency of 222kHz for the 14″ and 36″ ranges and 150kHz for the 72″ range. This sensor has a narrow sensing beam. Sensing ranges available for the RPS-302 include 4″ to 14″, 5″ to 36″ and 8″ to 72″. Mounting flanges, LED indicators, ranging potentiometers, and 6-ft. transducer cables are included. Optional cable lengths are available. Proximity detection is the detection of an object in a given range. 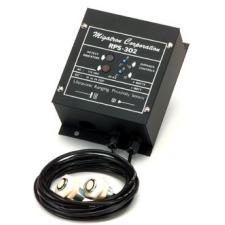 The detection range of the RPS-302 is controlled by the “Range Control” potentiometers located on the front cover of the controller. Any object within the desired range is detected, while objects out of range are ignored. The detect point is independent of size, material, and reflectivity.